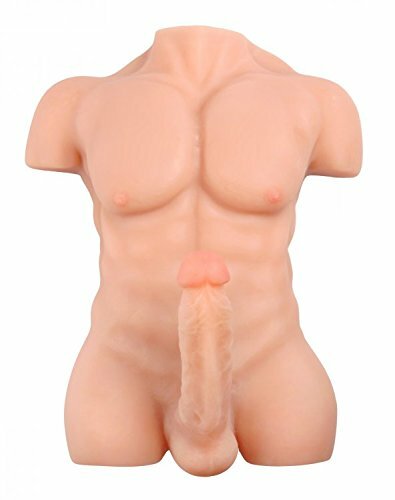 Beautifully chiseled and packing a most impressive piece Sexflesh’s Chiseled Chad Male Love Doll is a sight to behold and wonder to experience. Despite the entire toy being smaller than a life-size love slave this hearty chunk of man flesh still boasts a most life size fun rod measuring 8 rigid inches with a solid 2” diameter it’s nothing short of a ride made in hot and heavy heaven! Made with a firm inner core and ultra-soft, lifelike outer “skin” this 18 inch long, 15 inch wide and 5.5 inch thick perpetual pleasure producer makes storage incredibly convenient without sacrificing any manhood. It’s an incredible combination that ensures, with proper cleansing and a quality water based lubricant, many of year of private bedroom bliss. Although Chiseled Chad is welcomed to be loved by any woman who seeks his affection he is also specially equipped with a taught and ribbed backdoor tunnel that even has an opening at the very end to allow you the ability to thoroughly clean him post coitus with ease and efficiency! Chiseled Chad is always raring to go and he never kisses and tells. His product packaging and shipping box is a non-descript brown to help keep all your naughty little secrets from even the most prying of mail gawkers. With proper cleaning with gentle soap and water, the clean and tacky flesh refreshed with corn starch and if he is used with only water based lubricants Chiseled Chad will last you a veritable lifetime and never any buyer’s regret!